Our lovingly renovated and furnished old stone house situated on the edge of the old town of Novi Vinodolski. Everything can be reached from here on foot. 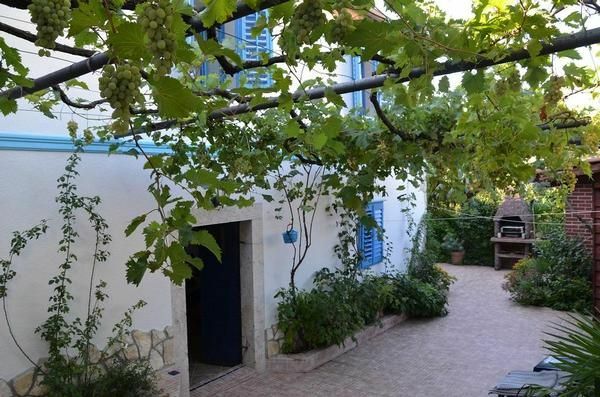 A secluded plot, large covered terrace, old fig trees and vines to the charm of this old house. Whether lulled on the terrace in the hammock at noon or in the shade of the grapes, here you can let your mind wander. The sea can be reached in 10 minutes. All shopping and restaurants in a few minutes. Morning wake me the church bells, some rays cheat through the shutters. The white curtains move in the breeze. I make the shutters and a bright blue sky without any Wölckchen receives me. The sea is smooth as a mirror - which is a beautiful day. The children have already brought bread, crisp and still warm white bread, in addition to Croatian honey, Dalmatian ham, so the day can begin. We pack up our things and from the beach, in our favorite bay. We romp us out in the crystal clear, warm water. The kids have so much to discover - shells, fish, sea urchins, beautiful stones and everything must! In the midday heat goes home, make Siesta - who on the terrace in the hammock, who on a sunbed under the fig. In the afternoon recover to the beach, swim and enjoy the beautiful sunset. Evening after the shower goes to town - let's see what we've Appettit today - great pizza or maybe a meat plate mmit fries? Then definitely an ice cream. What a successful day - I am looking forward to tomorrow! Take a look at Facebook - Urgemütliches "old stone house". Pet: once per animal costs 50 EUR (compulsory). Electricity: per object and week costs of 50 EUR (obligatory).